I am anxiously awaiting the arrival of my copy of Harry Potter and the Cursed Child. Until then, I'm finishing rereading Harry Potter and the Deathly Hallows and trying my best to avoid encountering any spoilers of the play online. Out of all of the installments in the Harry Potter series, the final book is undoubtedly the one where I feel like I learn or notice something new each time I read it. This makes sense as it's usually the one fans have read or reread the least number of times, and also in part because when I first read it, I plowed through it so fast I entirely missed a couple of major plot points. I remember talking about it after its release with a good friend and when she mentioned how surprised she was by a secondary character's death. I was completely surprised too, because I didn't even notice. That's right, I'd flown right past it. There's so much to love about this book and the high-stakes way in which Rowling concludes the series. [Spoiler alerts from here on.] There's a heightened sense of adventure with Hermoine, Ron, and Harry out on their own, traveling around the countryside trying to hunt and destroy horcruxes while learning about the deathly hallows, Dumbledore's past, and what it will take to kill Voldemort. Separating Harry, Ron, and Hermoine from both Hogwarts and their families really intensifies the sense of urgency and isolation of their task. (1) Dudley's emotions at his parting from Harry. While Dudley has been a completely unlikable character, I really appreciate moments when Rowling humanizes villains or complicates what might otherwise be flat characters. It's appropriate that there's no crying or hugging here, just Dudley's simple and sincere question of where Harry's going and what's going to happen to him. On Pottermore, Rowling explains that Dudley and Harry continue to meet yearly during the holidays to allow their kids to spend time with each other; though the encounters are awkward, I think the tradition is significant. Because Harry's never had a loving family, and because Dudley's all Harry has left from his mother's line, the choice to break the pattern of the past shows great maturity. Even if they're never going to be friends, Harry and Dudley's reunions provide a satisfying resolution to their relationship. (2) Luna's painting on her bedroom ceiling. The portrait of Harry, Hermoine, Ron, Neville, and Ginny encircled by a gold chain repeating the word "friends" is sweet and pure, just like Luna. When Harry sees it, he feels a surge of ever-growing affection and appreciation for her. Luna's character teaches so many lessons about not judging others, loyalty, and kindness. (3) Luna's words at Dobby's funeral. Though her speech is short, in just a few lines she is able to so completely and purely express her gratitude for the elf she only met once and yet at the same time she is able to say the words that Harry is himself unable to speak. Once again, her heart just radiates sweetness. (4) Hermoine's reaction to Ron's return. I love, love, love that when Ron comes back to help Harry and Hermoine, she doesn't welcome him with open arms. I laugh every time she curses Ron and pummels him with her fists until Harry casts a protective barrier between the two of them. While yes, she eventually forgives him, I adore that she doesn't hide her anger, the betrayal, and the danger they've narrowly survived during his absence. (5) The Potterwatch Radio Program. Though Ron, Harry, and Hermoine only listen to one full broadcast while out hunting horcruxes, hearing the voices of Lee Jordan, Kingsley Shackleboat, Remus Lupin, and Fred Weasley is a huge boost to their confidence that they are not alone in the fight against Voldemort and that their friends and family continue to engage in the battle alongside them. Hagrid's Harry Potter party makes me laugh and even thought I've written this several times now, I'll mention it once more time: yes, Fred is my favorite Weasley twin and this broadcast is just another small reason why. You can imagine my tears when he's killed during a moment of pure delight that Percy's not only returned to fight alongside his family, but he's also said a joke. Oh, Fred, rest in peace. (6) Snape's revelation about Lily. This just kills me. I don't think I will ever see the one-word sentence "Always" and not be able to think about what it means in its context here. One of my favorite elements of literature is the use of unreliable narrators or characters who are not fully good nor fully bad, but in this odd liminal space between. I love that Snape becomes that element within the Harry Potter series because often we all feel like we're in that place as well, battling the divide between the mixed elements of our hearts. (6) The final duel with Voldemort. So many emotions! As Harry exits Hogwarts and walks towards what he knows will be his final moments squaring off against Voldemort, I can barely read the words on the page. The golden snitch finally "opening at the close," the presence of his loved ones around him, his readiness to give his life going down fighting, the battle itself, Dumbledore, Hagrid, the crowd, the spell he ultimately uses--it's just all so fantastic. 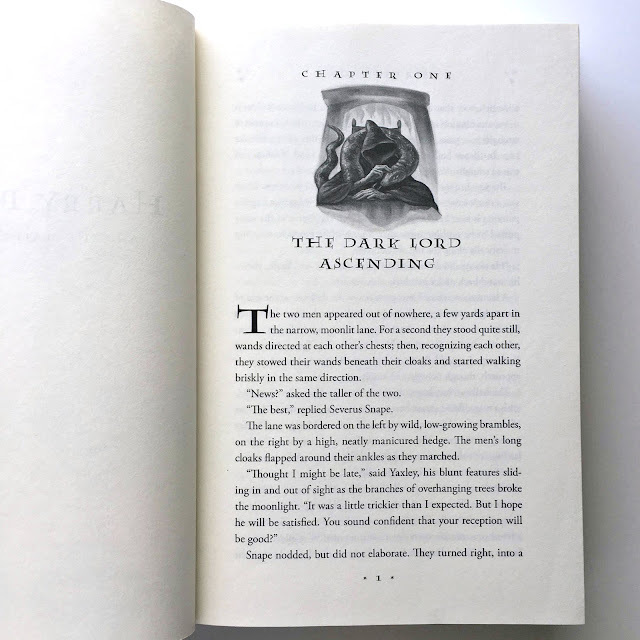 During the entire book, I find myself counting and recounting all of the horcruxes and hallows to see how everything culminates and to witness strands from the series come full-circle during its ending. It's such a satisfying reading experience. Have you reread the series? What are your favorite moments in Harry Potter and the Deathly Hallows? Have you already gotten your copy of Harry Potter and the Cursed Child? I cannot wait! 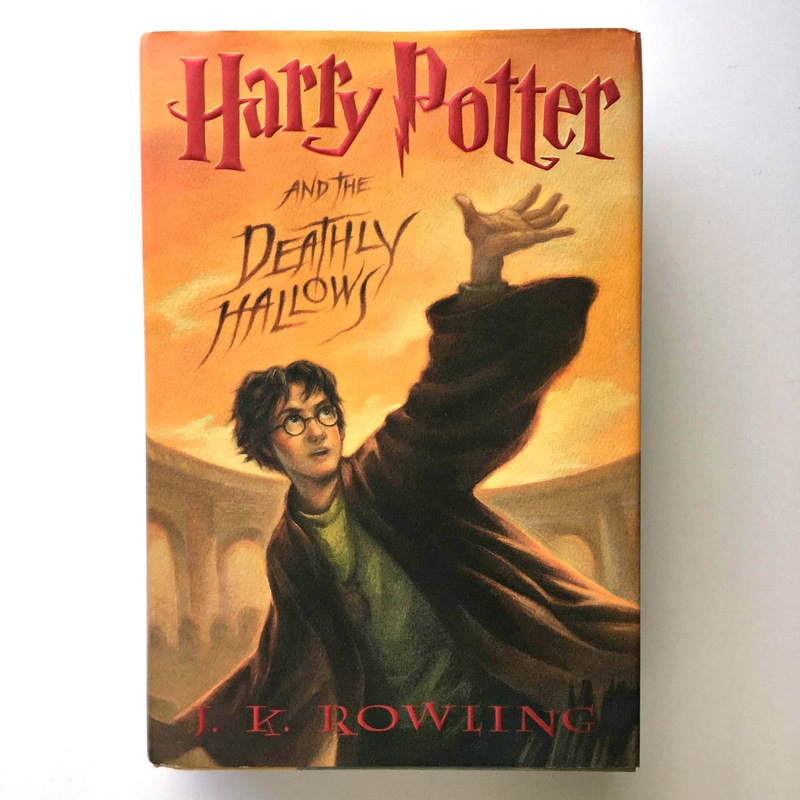 Just thought you should know that I have LOVED your Harry Potter reviews - it's making me want to either read them all again or listen to Jim Dale's magical reading skill in the audiobooks. I love these books! I was once asked what book I would want with me if I were stranded on a desert island and I responded that I'd want the whole Harry Potter series - because, in my opinion, it really counts as ONE story. I'm declaring it so, anyway. Thanks, Katy! I agree with you--it reads as one story and it's definitely desert island worthy. After finishing rereading this series, I think later this year I'll go back to either the "Little House on the Prairie," "Chronicles of Narnia," or "Anne of Green Gables" series to quench my book series thirst.